Since its launch in 2003, the team at Squarespace has developed dozens of templates to suit practically every website use case. This is impressive, especially when you consider each template is fully responsive. However, this wealth of choice also makes it harder for you to determine which template is suitable for your needs. Therefore, in this blog post, we’re going to take a look at the best Squarespace templates for writers. All Squarespace websites start with a template to determine the site’s functionality and style. You can customise any template’s design to make it your own, but there are certain features and parameters you can’t adjust in order to ensure your website still remains professional-looking. This is perfect if you’re not familiar with HTML but you would still like some control over the design of your website or portfolio. More importantly, you can go back and edit your template as many times as you like, and with drag-and-drop management, it really is simple. To help you in your search and make this stage of the website-building process a little easier, we’ve listed our seven top templates below. 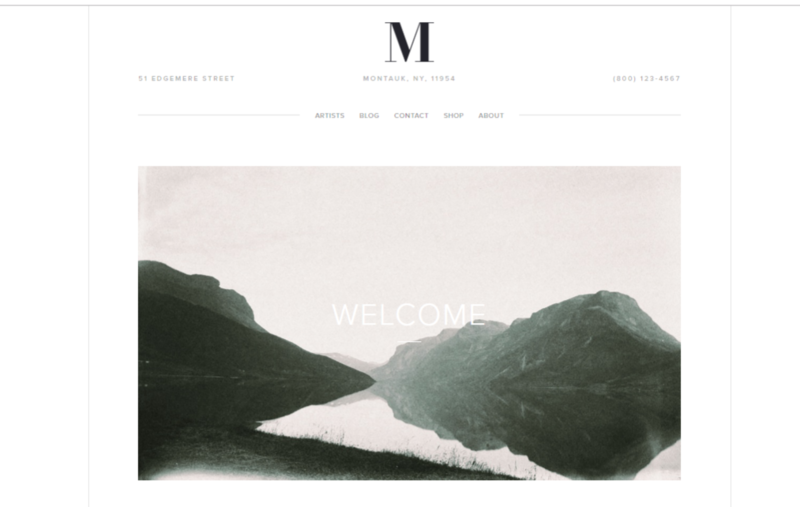 If you’re looking to showcase your writing portfolio, Montauk is a great template to consider. With a trendy design, its simplistic layout allows visitors to focus on the most important thing – your work. Alongside highlighting your previous writing experience, Montauk has blogging capabilities too, so you can post your own thoughts and insights alongside any published material. Check out the demo for Montauk here. Julia, Kent, and Om are also in the same template family, so take a look at these too for even greater choice. Usually championed as the template for businesses, Bedford is also a great option for writers. The aesthetic is classic and headers serve to place emphasis on your featured posts, although these aren’t customisable. You can, however, include different sidebar content on each of your pages. A good example of a copywriter using the Bedford template successfully is Jackie Pearce. Site visitors can easily view her extensive portfolio, check out her latest blog articles and learn more about her mission and achievements. Check out the demo for Bedford here. One of the best Squarespace templates for copywriters looking to publish blog content on their website is Skye. A magazine-style template, it offers a streamlined experience on a balanced and clean grid layout. However, there’s also the option to include ‘next post, last post’ preview buttons and author profiles. Showcasing your name, picture and bio, the author profile can be displayed below the post or in the sidebar, which is perfect for telling readers more about yourself, especially if they’re new to your website. Take a look at the demo for Skye here. Tudor is from the same template family as Skye, so it’s identical in terms of the features and controls available. However, you’ll find you have greater control over the way the homepage functions as well as how individual blog posts look. For example, there are excellent interactive post navigation options, including special navigation arrows that show the thumbnail and title of the next or previous post and a progress pie chart, which visually represents how far along your blog post a visitor is. Take a look at the demo for Tudor here. 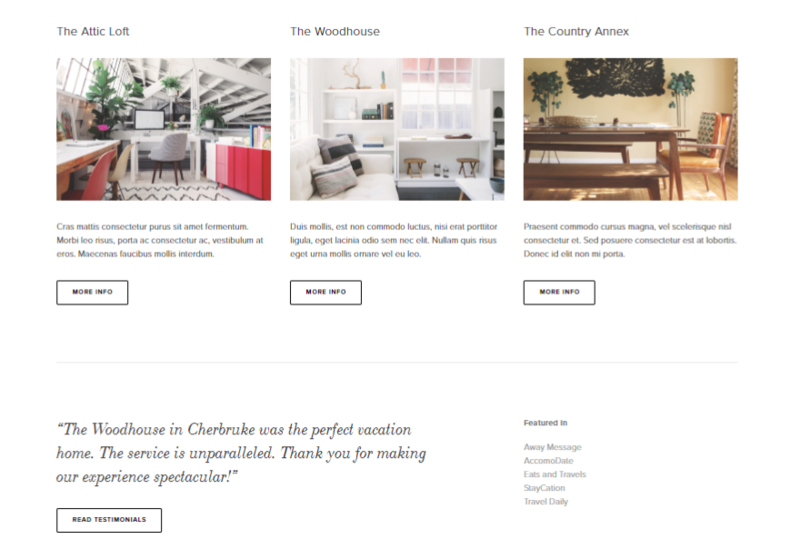 Squarespace’s Native template is another good option for writers looking to post blog content regularly; it has a great gallery setup and excellent social media integration, allowing you to further expand your reach. Native presents content on a scrolling page, which also lends itself perfectly to storytelling. With a simple and clean layout, it really helps to showcase your words, images and posts in an attractive and engaging light. There’s also a number of unique blogging options, including round thumbnail images displayed above post excerpts and the option to add your specific location to each blog. Take a look at the demo for Native here. A great example of a Native template in action is Erin E. Gold’s website. A freelance writer, site visitors can view her portfolio and get in touch to enquire about her work. What about Squarespace’s other templates? We’ve only mentioned a handful of Squarespace’s templates here, but there are a couple of other options that are great for small business owners, whether you’ve just started your own freelance writing business or you’re looking to improve your online presence with a blog. Rally has a long, scrolling homepage which is perfect for engaging visitors. You can weave various blog posts with attractive banner images to streamline your text and photographs in an alluring way. This is a top choice for eCommerce business owners looking for a flexible and adaptable template which allows them to publish content related to their products and services. Another template to consider is Five, which offers a number of features for styling your site. For example, with Five you can display up to two sidebars on each page, which is useful for collecting information from site visitors, highlighting other pages on your website and displaying relevant content. Five’s blog page display, a list of vertically stacked posts, is set in stone, but excellent features such as bylines, datelines and excerpts make up for this. No matter whether you’re writing for personal or commercial reasons, Squarespace is great for boosting your visibility. But it’s important you pick a template which is going to meet all your content management and marketing needs, so ensure you look at the demos for any template you’re considering before you make your final decision. Remember to also take advantage of Squarespace’s free 14-day trial before committing to one of their personal or business plans too to see if it’s right for you. If you’re looking to improve your writing skills before starting your own blog on Squarespace, you want to supplement your freelance income, or you need blog posts writing for your business website, get in touch with us at Copify today for information about our copywriting services.